A couple from Queens, New York, recently spotted something they're calling "OctoPossum." Gene Gray and his wife, Heewon Lee Gray, recently moved into their apartment in the Upper Ditmars neighbourhood of Astoria. They decided to open up their doors to take in the nice weather on Tuesday morning while going through their morning routines, when out of nowhere, Heewon Lee saw something moving outside. "My wife said, 'Gene, OMG... What is that?'" Gene Gray said. 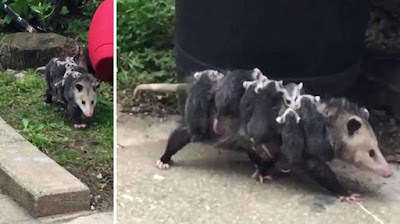 The couple looked a little closer and realised it was an opossum, carrying eight young joeys. "I guess the opossum thought it was a nice day as well and decided to take the kids out for a walk," Gray said. "I grabbed my iPhone and after fumbling was finally able to capture the footage." The moment was brief, but quite an experience for the Grays. "Poor OctoPossum looked wiped out, but the little ones held on tight," said Gene Gray. Gray said they watched the video over and over to figure out exactly how many joeys were gipping their mother's back. When they came up with eight, they knew they had to call it "OctoPossum."